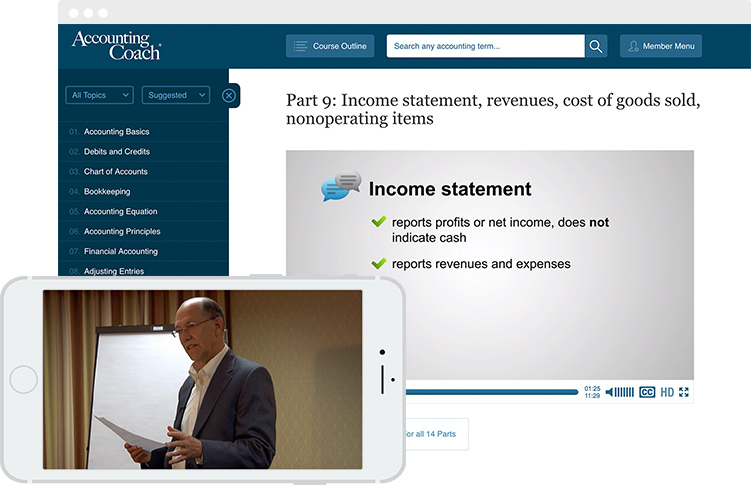 Gain an even more in-depth understanding of fundamental accounting with PRO's video seminars. The Bookkeeping Basics Seminar (13 videos total) will help you build confidence and understanding of debits and credits, adjusting entries, transactions, and more. The Understanding Financial Statements Seminar (14 videos total), teaches you all about balance sheets, income statements, and cash flow statements. The flashcards provide you with crystal-clear accounting definitions, so you can master complex terminology faster and easier. Access the flashcards on any device including your desktop, laptop, tablet, or smartphone. For some accounting concepts, just reading about them isn’t enough. So we created 8 Visual Tutorials to explain important accounting topics in a more intuitive away. Simply following along step-by-step. 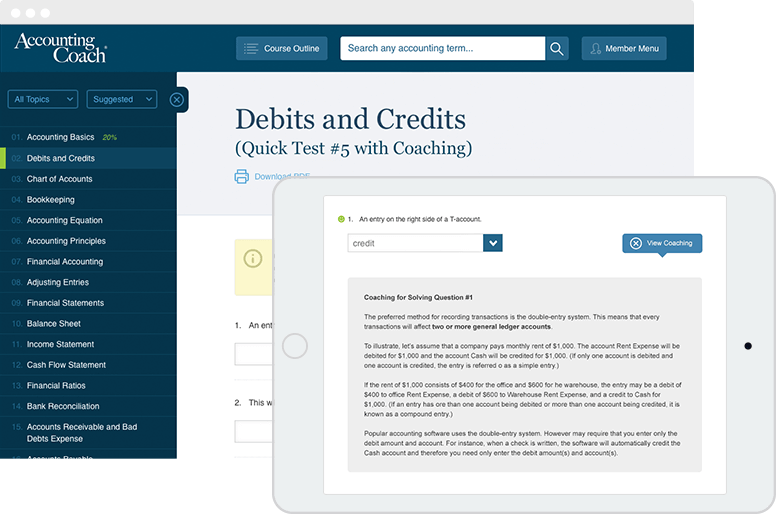 The Quick Tests contain more than 1,800 test questions written by the Accounting Coach himself. Our quick tests can be taken online or printed in PDF format. Answer key is included. The Quick Tests with Coaching have been developed for 7 important topics. For each question we provided detailed coaching for solving the answer. Our quick tests can be taken online or printed in PDF format. Answer key is included. 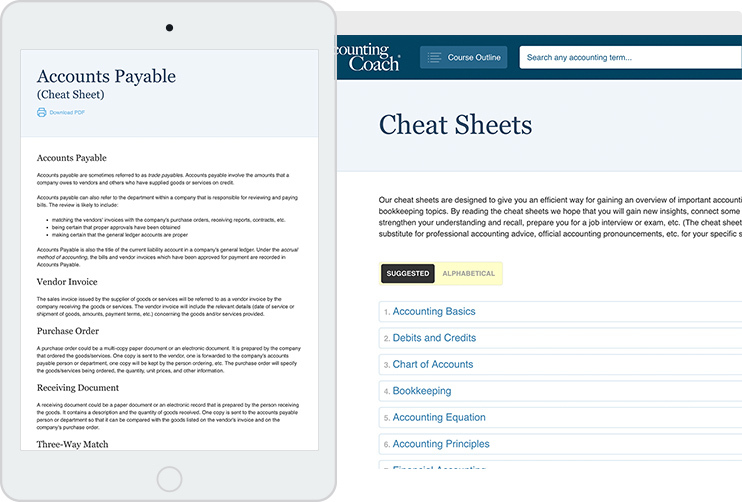 With AccountingCoach PRO, you'll have access to our exclusive cheat sheets, packed with definitions, terminology, formulas, and ratios. The Cheat Sheets provide you with all the most important study concepts for study, in one place. You'll also receive our special Guide to Bookkeeping Concepts as well as our Guide to Managerial & Cost Accounting. Stop scouring the web for accounting forms! AccountingCoach PRO gives you 80+ real business documents like Financial Statements, Financial Ratios and Analysis Forms, and Depreciation and Amortization Forms. Each Excel form allows you to customize our templates to fit your exact needs. Please note that templates do not include formulas. We've also included simple, intuitive progress tracking as a part of every PRO learning module. No more wondering which assignments you’ve completed, and which ones you still have left. Now you can see exactly where you are in the course, with just a glance. 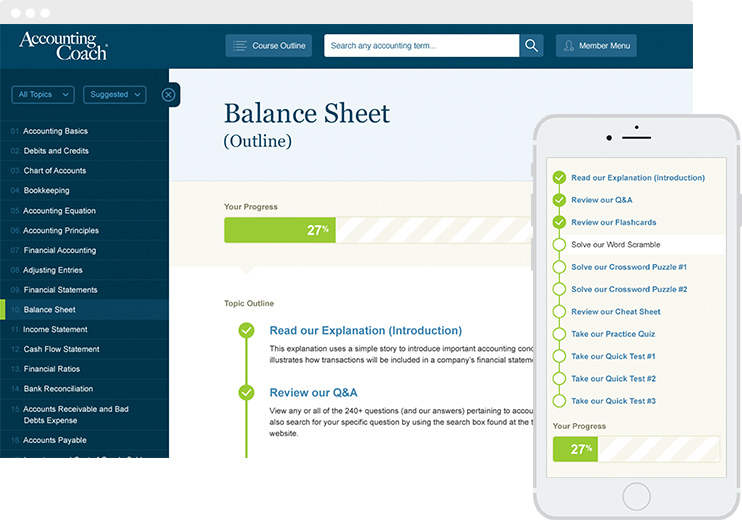 With progress tracking, your AccountingCoach learning path will be easy to visualize, helping you stay motivated and on-track as you move through the lessons. Oh my gosh! To say that AccountingCoach has "helped" me is a total understatement. This site has been a godsend for my practice. I thought I knew everything about accounting and bookkeeping; however, since I've been subscribed to AccountingCoach, I can't begin to tell you how many times I've referred to it when I would question myself. Because of you, I have become a better bookkeeper, more knowledgeable in accounting, and the learning does not stop! I continue to improve my abilities every week. And what's best about all this is that my clients are the beneficiaries and that's what it's all about! Thank you AccountingCoach!! I have been using AccountingCoach in my bookkeeping business for a few years now and love it! There are times when I need an answer to some accounting situation that baffles me and I have always been able to find the answers I need on your website. I particularly like the clear and concise way the materials are presented so I can quickly get results. The lifetime PRO membership is the greatest purchase ever. This is like having your own personal tutor at your fingertips!! I love it. I have benefited greatly from my purchase. I recently had to use this site for a college course and it is a great learning resource for any accounting class too. I can't recommend it enough. AccountingCoach PRO landed me a job I had been praying for. I have a background in Banking & Finance with basic accounting. However, over the years while working in the bank, I majored in customer service and branch management. When I left the bank, I was out of a job for about a year but volunteering in an NGO. I sought a job as a Finance Officer in another NGO (where I am presently working) but I needed to brush up on my accounting skills. AccountingCoach PRO helped me get back on track and I landed the job! And with a lifetime membership, what more could I ask for? AccountingCoach was a perfect refresher course. I have a degree in accounting and earned my CPA but that was long, long ago. I spent most of my career as a business consultant and did not use my accounting knowledge on a daily basis. Some 20 years later after taking a few years off I was looking to re-enter the workforce on a part time basis and felt bookkeeping work would provide me with the greatest opportunity and life balance. I found a local company that employed people just like me to do bookkeeping for clients, but I would need to pass an accounting test in order to be hired. However, I was a bit rusty and needed a refresher. After some Internet research I chose AccountingCoach. I ran through the first 20 modules in about a week which covered all of the basics. It was a perfect refresher and everything came back to me. I ended up passing the test with flying colors and have found part-time work managing the finances for a small nonprofit in the area. I cannot express the level of education that AccountingCoach provides. After owning my own accounting firm for 10 years, I still need to review the basic and complicated accounting principles. I visit AccountingCoach website every month and every time I learn something new. I would strongly suggest this site, I wish this site was known to me when I was a student. Thank you AccountingCoach, you have helped me over the last 8 years of study and guided me to my dream job of becoming an accountant. I've answered and explained all the hard questions that I needed to get me where I am today and I certainly couldn't have done it without you! I will continue to use AccountingCoach PRO for the rest of my career. You are the best. Becoming a member of AccountingCoach was hands down a great decision for me. I have been in bookkeeping for over 16 years and all the training I had was from the CPA that I worked for. While I felt I had a good foundation and years of experience, once I took the leap and branched out with my own bookkeeping practice I felt the need to brush up on my skills. AccountingCoach actually not only helped me brush up on my knowledge, but has helped me pinpoint my strengths and weaknesses which allowed me to focus on those areas that I was lacking knowledge. It was also a great boost to see how much knowledge I already had. I think it was a great investment and I love knowing that when I second-guess myself I can easily log in and review the information needed. Worth every penny! AccountingCoach got me through university without a tutor! Invaluable resource, even after school!! Thank you so much for providing such a useful, accurate and easy to understand resource! Well worth the membership fee! I got an A+ in my accounting classes! AccountingCoach allowed me to understand accounting principles without any prior knowledge. Using simple to follow step-by-step explanations, I was able to grasp how debit and credit works, how balance sheet and income statement complimented each other, what the cash flow statement is and how to create one. I have tried many different books and online resources on accounting but only AccountingCoach managed to convey information in such a way that a person with zero previous knowledge or experience on the subject was able to finally understand and be able to apply it in real-life situations. I purchased the AccountingCoach PRO membership after my accounting tutor recommended it. I use AccountingCoach PRO in conjunction with my post-graduate textbooks - I am very pleased with it! For the unbelievably low price, I have access to templates with formulas, exams, glossaries, explanations and more! Thank you very much for creating this and keeping it updated! I highly recommend it to all others! Our company uses AccountingCoach PRO and has for several years. Our employees sign up for PRO under their own name so that they have a lifetime of educational value for training. We feel that our participation in PRO has improved performance in our Accounting Department with our new hires, and enabled our employees to practice accounting best practices in their everyday work. This has enabled our Accounting employees to do better in their assignments---which increases their earning power. We feel that over the years AccountingCoach PRO has also improved our company’s bottom line. The cost is well-priced for their products, and their customer service and support is phenomenal. We will continue to use AccountingCoach PRO for all of our educational needs and highly recommend their program. It is my sincere pleasure to give full support for the AccountingCoach website. As a college professor at two (2) colleges and a full-time accounting professional at Toyota, I refer my students to the AccountingCoach website for source data, concept explanations and resources. AccountingCoach is one of my main sources for accounting information, it has easy access and the information provided is simple to understand. My students and I love the site. My lectures are more powerful because I use the site as my validation and source data. The site makes teaching and applying accounting concepts so much easier when you have a reliable source like AccountingCoach. The site is full of information and will give you the knowledge base to be successful in the world of accounting and in business. The site is great for those who may not make it to college to take a formal accounting course like mine. It is a great benefit. Thank you AccountingCoach for assisting us, ensuring the world of accounting is easier to understand, and for providing an easy to use site for finding information and an affordable pathway to increase your knowledge. The AccountingCoach curriculum has been an invaluable asset because of the wealth of information at my fingertips. With my unpredictable schedule I've been unable to pursue regular class studies but my investment in AccountingCoach PRO has afforded me the opportunity to study at my pace and schedule. The tax preparation company I work for has noticed my improved business accounting talents and has placed me with the business consulting division. Shortly after changing my major to Accounting last year, I found AccountingCoach and signed up for the PRO membership. I cannot tell you how many times I've gone to that website for help with something in my homework assignments. The answers are easy to understand, even for a beginner like me. All of the information is simple to read and presented in a way that helps me learn. Thank you! With AccountingCoach PRO, you’ll gain deep-level knowledge and powerful insights into your business. With your increased understanding, you’ll become a valued contributor with the confidence to participate in important financial discussions. Accounting isn’t just for accountants. Today, everyone needs to improve their financial literacy. For men and women who want to master accounting and take full control of their careers, AccountingCoach PRO is the clear choice. 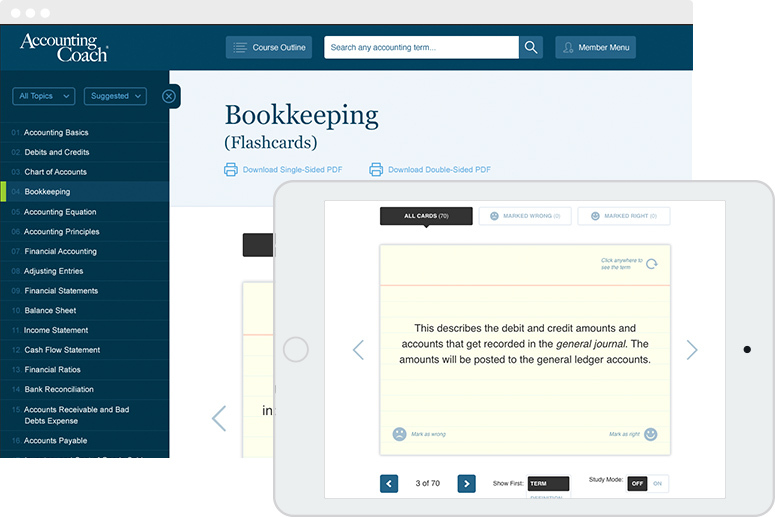 For accountants and bookkeepers returning to the workplace, AccountingCoach PRO is the ideal learning resource. You’ll gain a deeper, more thorough understanding of critical skills that may have gotten rusty over time. And for someone looking to obtain a bookkeeping certification, AccountingCoach PRO Plus contains four Certificates of Achievement which can be earned by passing the related exams. If you’re feeling lost in your accounting class and are starting to fall behind, AccountingCoach PRO can help. Forget about expensive, textbooks, study guides, and outdated class materials. AccountingCoach PRO explains the fundamentals of accounting in simple, easy to grasp terms, with examples to reinforce everything you learn. But it’s not his degrees or certifications that make Harold such a great teacher. It’s his unique ability to explain accounting in clear, concise language that even people without business training can easily grasp. By combining accounting theory with real-world examples, Harold brings accounting to life for students in ways that no textbook, lecture, or run-of-the-mill course can. You will receive instant access to your certificate when you achieve a 70% passing score on our 40-question, multiple-choice exam. You may download and print your certificate in high-quality PDF format, share your unique URL online, or add your certificate to your LinkedIn profile. I stumbled across the website for AccountingCoach, and I am glad I did. I have always enjoyed bookkeeping, but I have never been formally trained. After receiving and reviewing the material with AccountingCoach PRO I can honestly say this is the best product I have ever purchased. The lifetime membership is worth the cost. The courses are set up for the beginner to the most advanced and is written in a very clear format. I would recommend AccountingCoach to anyone wanting to learn, or take a refresher course on accounting and bookkeeping. I can't say enough good things about AccountingCoach. As an economist working in corporate tax, I needed to learn how to interpret accounting data quickly in order to succeed in my job. I've been an active user since around 2008, and over the years I've realized it's the only accounting resource I need. Thank you, AccountingCoach! I am truly grateful to AccountingCoach who has not only been a lifeline, but has been a rescuer on numerous occasions. I appreciate the in-depth explanations, concepts and even links to obtain additional information, especially when going through an on-the-job crunch period with close deadlines. I highly recommend AccountingCoach to everyone. Those in large or small companies, business owners, and all levels of educational studies, will find AccountingCoach a great go-to source! Basically, ridiculous. The amount of information you can get from this site, business forms, dictionaries, flashcards, videos... It's not only a steal for the price, I even feel bad! What Harold and his staff have created is the terror of any institution that teaches accounting. AccountingCoach has become my accounting reference guide for everything and I'm sure anyone who starts to dig a little bit will find this site more than useful. You will get exposure to multiple topics, from simple common-sense things to complex and advanced accounting subjects. Best part? There's no limit to how many times you can come back and review it, because this isn't a paid semester for college, but a life-time membership! It's incredible - no rush, no hassle, no stress, no '30-days membership' offer, no pre-determined way to take a course. You learn at your own pace, the topics you decide, whatever you need help with, and it's all there for you, available 24/7. To conclude, I want to thank AccountingCoach in general for the amazing product they run; you won't find anything this good, I believe, in the market. I've yet to find a fault, so keep it up, guys! AccountingCoach PRO is an exceptional service. It not only provides all the essential material to succeed in learning accounting and finance, but also explains all the relevant details that make the difference when you need to understand the complexity of accounting systems. As a communication trainer and business coach, I had to pick up the language of accounting in no time in order to communicate more effectively with my clients. This website's benefits have exceeded my expectations. Many thanks for your great support. Going to college to learn accounting isn't an option for me. I'm a single mother of three. I am a self-taught bookkeeper thanks to AccountingCoach. I do taxes for businesses. One of the businesses I do bookkeeping & accounting for was recently audited. Thanks to AccountingCoach PRO, I showed the state auditor a thing or two. I have been complimented on my business practices by several people. I have had business owners tell me that bookkeepers/accountants do not comprehend or understand accounting concepts, which they went to college for years to learn, as well as I do. AccountingCoach PRO has made it possible for me to further my career, making a higher income. I have to turn clients away, because I simply do not have the time to assist them. Thank you AccountingCoach! I discovered AccountingCoach while I was teaching an Accounting 1 class at the college I work at and provided the website to my students to supplement their learning experience. I know it made a difference! I am a Small Business Development Center adviser and workshop presenter and I provide the AccountingCoach website to my clients and workshop attendees to help them learn accounting. 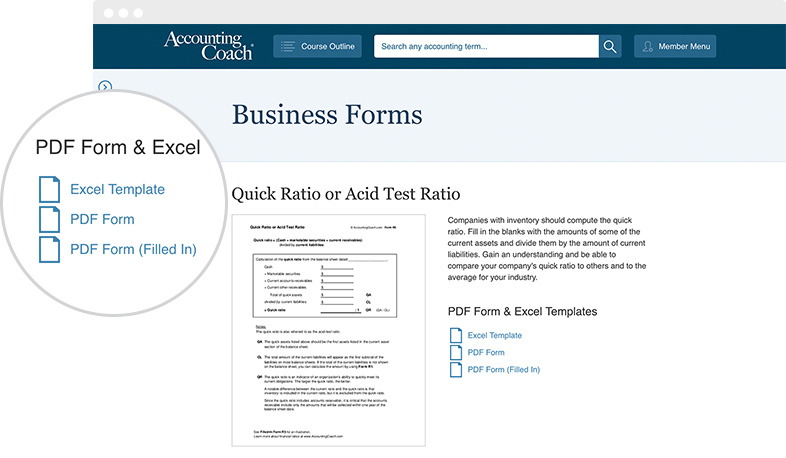 AccountingCoach is a great resource for small business people! I was interested in getting my finances under control. I was advised to track my expenses but I had no background in accounting. I wanted to do proper record keeping and not just of expenses, but my wealth. I came across many tutorials online. The most comprehensive tutorials were those of AccountingCoach. After being able to quickly learn, I decided to go PRO to have access to additional learning tools. I love the quizzes, they help me determine if I truly understand the material. After 1 year, I know enough about accounting to manage my finances and grow my wealth. Going PRO is one of the best investments I've made. Thank you AccountingCoach! The lifetime PRO membership is indeed one of the smartest purchases I've ever made. I have used it all as a refresher course, as a study guide, and reference to my current client issues. The extraordinarily clear and engaging explanations make self-study possible for anyone with an interest in accounting. I simply can't recommend it enough. Thank you AccountingCoach. Getting a lifetime PRO membership at AccountingCoach was one of the best investments I have ever made in the field of accounting and finance. AccountingCoach makes accounting concepts and principles easy to understand and I have learned a great deal from using AccountingCoach in the last few years. I am a licensed tax preparer and I took accounting courses many ages ago. Having 24/7 access to a well-organized set of materials on a wide range of topics on accounting and bookkeeping has been very valuable to me. It has helped me stay up-to-date with my knowledge and understanding of modern-day accounting concepts, and as a result, better digest and dissect financial statements given to me by my business clients. Thank you, AccountingCoach. I registered for AccountingCoach PRO to help me with basic accounting information for some MBA coursework I am pursuing. It turned out to be a lot more than that! In its clear, yet comprehensive manner, AccountingCoach provides foundational materials, sample exams, study notes, visual aids, and dictionary terms. If you have any need for assistance with all things accounting, AccountingCoach should be your first stop. I highly recommend it to everyone wanting to understand accounting in more depth. AccountingCoach has been a God-send to me for years! When I got thrown into a bookkeeping position many years ago I floundered terribly until I stumbled upon AccountingCoach.com. I can't say enough about how thorough and detailed the website is with lessons, quizzes, tests, tons of downloads, guides, and handy cheat sheets. After only a few weeks on the website I had gained the skills and confidence I needed to become competent at and comfortable with my job. When I realized I loved bookkeeping I decided to enhance my knowledge even further with a college accounting course, and I must say in all honesty, it paled in comparison to what I was learning on AccountingCoach.com. Although I've been in bookkeeping many years now, there is always something for me to learn on AccountingCoach.com and I devote several hours every week to getting on the site to refresh my skills or to learn something new. This is a rare company in that it is devoted not only to teaching accounting and bookkeeping in easy-to-understand terms, but also to exceptional customer service! Thank you AccountingCoach for your genuine approach to all you do! "Accounting is not my strong suit. The AccountingCoach is the best source I know of that can walk me through the basics in a way that gives me confidence. It's always available 24/7. Can't say enough good things about it. Highly recommend it." -Tony C.
I was looking out for an online accounting course after a gap of 25 years. Luckily, I came across AccountingCoach. The very first visit to this site made me feel very comfortable. I felt as though it was made just for me. Very soon I enrolled myself as a PRO member. Now that I am able to access the entire site like the seminars, exams, crosswords and many many more interesting ways to learn accounting, my knowledge in accounting has deepened. I can confidently say to people who are new to this field, or who are trying for a refresher course like me, this is THE WEBSITE for you. It's a well-structured program, the most difficult accounting concepts have been explained in a very crystal clear fashion with beautiful real-life examples. Thanks to Mr Harold Averkamp and his dedicated team for sharing their deep insight. The PRO membership is great ROI. For those who are looking to learn accounting, this is one of greatest accounting courses you'll ever find online. AccountingCoach helps me tremendously. I always find-up-to date the financial and accounting information needed. As I move into the next phase of my work life and career, AccountingCoach PRO will be an essential tool as I move from employee to business owner. Thank you for this very valuable tool which continues to evolve and grow. Thank you for being my reference book as I complete my accounting degree. I had no experience in accounting or bookkeeping before completing this degree and understandably I was in over my head! All the way over in New Zealand I came across your website, subscribed, hoping I may learn even a couple of things and have ended up using your website as my main reference tool. The quizzes, question and answer pages, the entire website is so user friendly and I know it will see me through to the completion of my degree. I can't thank you enough, please keep up the fantastic work!!! I own a bookkeeping and tax business and I use AccountingCoach to train my bookkeepers. The value far exceeds the cost! I currently teach Bookkeeping at one of the colleges in New York City. Being a member of AccountingCoach PRO has helped me tremendously. There is always something new to learn and teach. The price is very affordable. I have always encouraged my students to join the site. I'm glad to say that some have and they have really benefited from what AccountingCoach PRO has to offer. I have been a member of AccountingCoach for many years now. I value the content and the easy-to-grasp manner in which the material is always explained. Many times I read the material here before studying it in my accounting book. I love AccountingCoach! They are very honorable as well. My membership continues to be valid after all these years. If I email them with questions about my membership or password or whatever else, they are always prompt to assist. I wish I had been a student of the founder of the site. He must have been a really wonderful professor!!! Thanks for putting all the work to create and maintain the site. You guys are the best!! AccountingCoach PRO membership has assisted me in keeping my accounting and bookkeeping skills sharp over the years. My bookkeeping business has benefited greatly. The membership pricing is very reasonable and the information is easy to understand and apply. It has helped me explain difficult accounting concepts to many of my clients. AccountingCoach helped me during the times I had trouble remembering accounting concepts. It is a very useful website encompassing a broad area of accounting and finance. Definitely the best go-to place for accountants like me. Thank you so much! As a European I studied the accounting system used in my particular country. I always wondered how accounting was done in the U.S. AccountingCoach has taught me everything I wanted to know. I've learned a lot about the terminology and the differences between accounting methods from the other side of the pond. I strongly believe that AccountingCoach is the best education program from a practical accounting point of view. Every tool like the accounting dictionary, crossword puzzles, word scrambles (I love it!) and so on explains difficult technical words with the most proper and simplest words Visual learning programs and Q&A archives are especially effective for non-native English speakers to understand current and practical usage methods of accounting terms. Right after graduating from university and getting my bachelor's degree in accountancy, I didn't manage to land a job in the accounting field, instead I got a job in banking. While the pay was a little bit higher than what many other fresh graduates would get in the accounting field, I didn't particularly enjoy what I was doing. So I decided to give what I was most interested in to begin with another shot. Unfortunately, I wasn't feeling very confident in my ability and knowledge in accounting because there was a particularly long lapse of time where I wasn't exposed to accounting. Thankfully I discovered this website, which explains the basics of what you need to know about accounting in a very concise and rather layman way. I also really appreciate that the administrator of the website tries to improve and add more content to the site instead of stagnating after getting my money. I can definitely recommend this site if you need to refresh yourself with accounting, or even just to help you with your study if you're still in the process of getting your degree. I am so impressed by AccountingCoach. I happened to stumble upon it when I was checking for an explanation on impairment. Ever since then my life has become uncomplicated and all these accounting books thrown out the window. It truly is the best! I could not believe it? I run my own accounting, bookkeeping practice and I am still today amazed about the way they have simplified things! I love it! Job well done to the team at AccountingCoach! I am your biggest fan! Thanks so much. I am a Granny of 67 years old, a South African National, studying for an undergraduate degree in Accounting. Coming across AccountingCoach was the best gift I ever received throughout my education pursuits. AccountingCoach is pleasantly user-friendly and a great study tool for senior citizens and those who study part time because of their busy work schedules. Even South African University students who are presently facing funding challenges in South Africa can use AccountingCoach as a study tool. Thank you. I am an experienced businessman now semi-retired and I guest lecture to senior managers in major UK companies and at academic institutions including some internationally famous business schools on topics such as Business Performance Measurement; Business Decision-Taking; and Assessing and Managing Risk. Although I understand business finance well, I never trained as an accountant. But to maintain high credibility when delivering my courses I need to be aware of and keep up to date with certain key international accounting standards and current accounting definitions and practices. I have found AccountingCoach to be an excellent way to do this and fantastic value for money. I am a small business accountant and tax preparer. A lot of my clients are do-it-yourself bookkeepers for their small business. Most of them, if not all, use bookkeeping software to keep track of their business. Although software programs are great at what they do and are "easy" for the user, the double entry accounting method is still occurring in the background. Accounting concepts and terms are not "easily" explained to a small business owner who doesn't understand why reports look the way they do. To help them, I always direct them to AccountingCoach to learn the concepts and terms. The tutorials, glossary, and web topics are presented in the best way that anyone can understand accounting. It's the best source on the web! Just want to let you know that I have learned so much from AccountingCoach PRO. I have had so many issues resolved simply by referring to AccountingCoach PRO when it comes to doing my everyday bookkeeping work. I am so glad that I discovered you and look forward to referring to this website a lot in the future...keep up the great work. I teach Accounting and this is the first website I give my students. I too, purchased the lifetime membership because it is a valuable resource for them and for anyone desiring to learn and understand Accounting. I even do the crossword puzzles, word scrambles, etc. to keep my skills sharp! Plus, it's fun! It's a challenge to keep my lectures interesting, and AccountingCoach helps tremendously. Thanks! I love, love, love your website, it has helped me to succeed in all the bookkeeping I have done off and on throughout the years. Whenever I had doubts I could easily access the website and find my answers quick and I love the videos. Very educational, accurate and reliable. The lifetime unlimited access was one of the best investments I have ever made a few years ago! Makes learning fun and I would suggest this to others in a heartbeat, business owners, employees won't be disappointed. Even those who do occasional bookkeeping will definitely be satisfied with any membership purchase. Thank you AccountingCoach for all that you have helped me with!!! Amazing site!! I am not an accountant, nor a bookkeeper, but I need to be aware of what's happening financially. Being able to consult AccountingCoach on a specific topic relating to our books has been a tremendous help to me. I very much appreciate your service! I don't have enough words to express how great the AccountingCoach is. I have been using it since the first day I became a member and it's incredibly good. AccountingCoach assisted me with training my team on the profit and loss statements. It helped me put the 'why' behind the terminology used. I would highly recommend AccountingCoach as a good resource for all levels of users! AccountingCoach has helped me a lot with my work as a manager. It has given me confidence in reading and looking at spreadsheets and budgets as well as giving me the tools to interpret our financial status and forecast future expectations at my work. A great idea to have it readily available for all of us managers and professionals that need to brush up on their accounting knowledge or learn to enhance their professional standings and job status. Thank you for the videos and cheat sheets, as I appreciate a great effort on your part to all of us that need to learn and revise their accounting and finance information and knowledge. I bought a small Accounting, Bookkeeping & Payroll business and had very little knowledge of accounting principles and felt I was way over my head. I was looking online for free training or help with just the basics. After a few website that did not help, I found AccountingCoach and signed up and it has helped me a great deal! I am not sure if my business would be as successful if I did not pick up the lessons so easily. AccountingCoach really makes learning easy and interesting, which is hard to do when it comes to accounting. I have recommended it to friends & family and I will continue to do so. Thank you AccountingCoach!!! 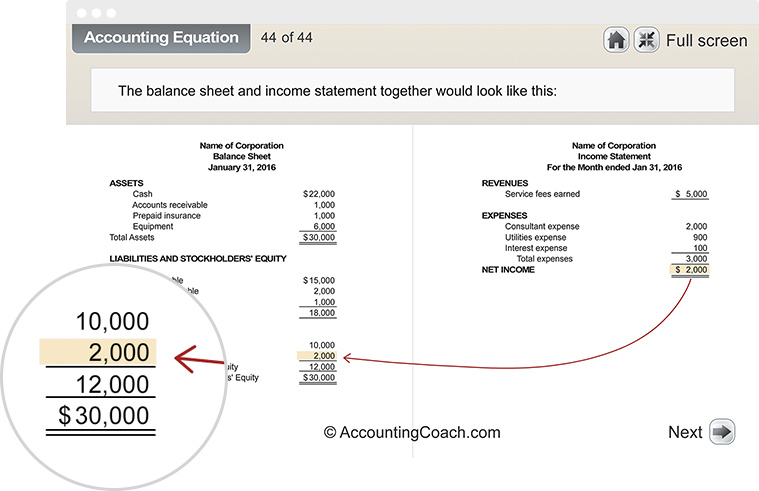 As a high school accounting teacher I have used the resources on AccountingCoach PRO to enhance my understanding of accounting concepts and make my explanation of concepts clearer for my students. I recommend AccountingCoach PRO to students pursuing higher level accounting after high school and to anyone teaching accounting classes---the money spent on this resource will be one of the best investments in professional development you'll make in your career. The PRO membership allows me to provide great explanations to my coworkers who are not versed in accounting without me spending a lot of time finding examples they may understand. I use my membership to review topics that I don't use very often and it has been one of the best investments I've made for my work and it costs less than my Accounting textbook! 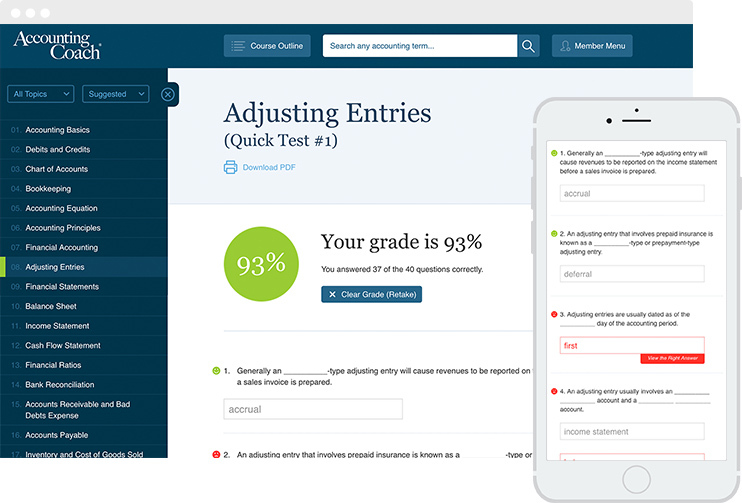 AccountingCoach has helped tremendously while I was studying for accounting and I strongly believe that my grade would not have been in the 90's had it not been for the AccountingCoach. I will always keep the AccountingCoach in my favourites list even though I have completed my courses as I will no doubt make reference to it when I second-guess myself. It has helped with all aspects of accounting from the very beginning to the very end. Whomever decided to create AccountingCoach was a genius because it is designed in a way that anyone from an amateur to a PRO can follow along. I recommend it to everyone. It has become my new limb. Cannot boast enough about it. Well worth it. Thank you AccountingCoach! As an auditor, I frequently encounter government and private financial transactions that I vaguely remember from my college years. The information and ease of finding the right accounting procedures to those instances has been an enormous help to me in my job. This has definitely been a good decision to be a member. I came across AccountingCoach some years ago and since then it has been my go-to solution for all and any problems or issues that arise in my day-to-day work. Whenever I come across a situation I have not faced before I sign in, read up on the related data, of which there is plenty, and solve another problem. I think of AccountingCoach as my personal library where I can look up information on any aspect of my business. My clients are always impressed with the results I provide. Thank you AccountingCoach. I started using AccountingCoach when I found myself unemployed and looking to brush up on my cost accounting skills. It was a wonderful tool and I found it easy to use and contained all the information I would need to get familiar with the topic, all while not having to go back to my college books or my CPA review materials. It is affordably priced and well worth investing in. I am now employed and the materials I studied helped me to prepare for questions I received in the interview process regarding topics I needed to brush up on. 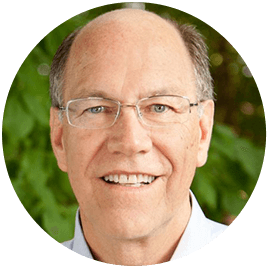 In my roles as a business owner, member of senior management teams and as a business consultant, I frequently deal with accounting-related issues. While I have a solid grasp of a wide range of accounting practices and methods, I still find that there are times when I want to refresh or investigate aspects of accounting that I either seldom visit or have not had the opportunity to work with. 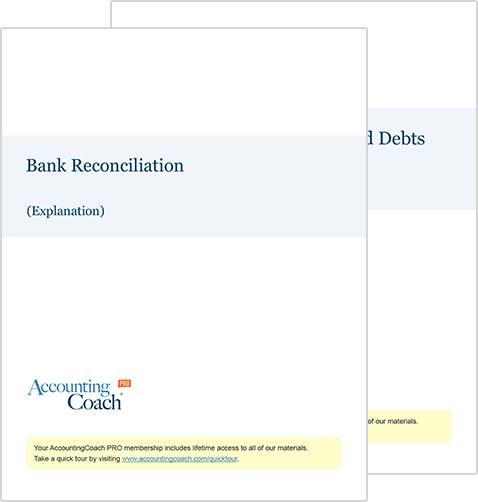 When those circumstances arise, I turn to AccountingCoach which I find covers not only a wide range of topics but usually in enough depth and detail that you can use it almost like a condensed primer on any given topic. The information and examples are complete enough that I find I can apply what is shown to the task at hand and have the result be equal to what I would get from an accounting professional. It is not an exaggeration to state that it has saved both time and cost on numerous occasions. Highly recommended! Living in a small tourist rural town, there are limited choices in the job market. I knew if I bumped up my skills, I would become eligible for a bookkeeping position locally. AccountingCoach has helped me do that. Such a small investment for a HUGE return. Thank you so much for making this available! I would like to say thank you very much for your support. I am a student of Accounting at George Mason University in Virginia. I found your website some time ago, and I have been a PRO member ever since. From the moment I found AccountingCoach, I recognize the value, quality and effort of your work. Currently, I am taking Financial Accounting. I confess I was scared because it has been awhile since I took accounting classes. Thankfully, AccountingCoach helps me to not just refresh my mind on basic accounting terminology, but also helps me to understand new terminology in plain English. I found AccountingCoach online about 2 years ago. It has helped me tremendously to brush up on knowledge and information about accounting that I don't have time to go to school for. I have been an accountant for many years and don't plan on going back to college at this point; I have a Bachelor’s degree already. I use AccountingCoach to study for a job in accounting if I am not familiar with the work or to understand something like cash flow statements when prepping for a job interview. Recently, I used the online exams extensively to study for a city accounting job; with great success. Thank you Harold! I have been using AccountingCoach in my bookkeeping business for a few years now and love it! There are times when I need an answer to some accounting situation that baffles me and always have been able to find the answers I need on your website. I particularly like the clear and concise way the material is presented so I can quickly get results. I enrolled in an accounting course online. I was sent textbooks and a workbook in the mail and that was it. I was on my own to figure out the rest. It was difficult trying to match the course and workbook together to do the lessons and exercises and the explanations left too many gaps and questions. I knew I needed extra support. I stumbled upon AccountingCoach in an internet search and from the little I was able to read, I gained a far better understanding than the college-level textbook I had been studying for months. I signed up for PRO and it got even better. I'm able to do more exercises and gain extra studying tools and more detailed explanations to ensure my understanding of the accounting process. Truthfully, I've learned more through the AccountingCoach Pro than the college textbook and it cost sooo much less! It has been a life saver. I don't think I could have continued without it. Thank you for creating such an amazing experience and giving me the confidence I needed to keep working towards my goal. AccountingCoach is a simply fantastic self-learning source. The way it explains various accounting concepts in such a simple and self explanatory manner is really commendable. Being an engineering student, with no past accounting background, AccountingCoach has been a great saviour in my MBA accounting module. The Balance Sheets, Statement of Cash Flows, and Income Statement all have been explained very beautifully. Thank you AccountingCoach. Keep up the good work. Copyright © 2004 - 2019 AccountingCoach, LLC. All rights reserved. Check this box to add our Certificates of Achievement ($50) to your order.Includes access to 4 different printable certificates after passing our exams. This will be your only chance for this special discount. How many PRO Plus accounts would you like to order? Email Address We will contact you at this address to create your accounts and send you a business invoice/receipt.